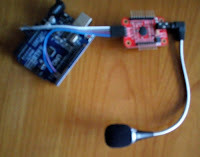 An interesting input device is the ElecHouse Voice Recognition Module V3. 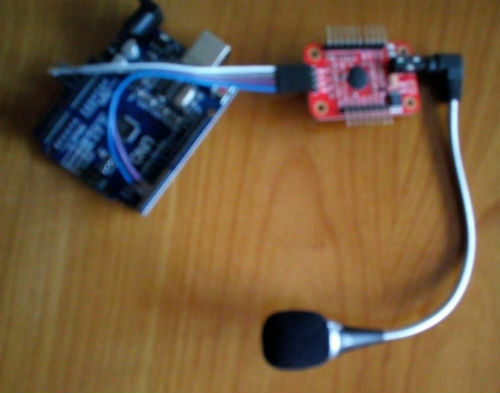 It comes with a microphone and some pins to solder on the PCB. I ordered my "1set Speed Recognition, Voice Recognition Module V3" module on Aliexpress (between 17 and 18 euro 2017). The question is what can this module do for your projects and how can you use it? The answer is simple: it can recognize your voice and output a signal depending on the word or short phrase that you have learned the module. The good news is that (according to the spec) you can train this relative cheap module to recognize 80 words or phrases. These words or phrases are stored in memory on the module. The bad news is the module can only recognize 7 different phrases at the same time. And you also need to train the system first with all your phrases. And yes, this are much more than 7 phrases! You can do this using a menu structure! Load only the word "James". If the module recognizes "James" load the three words "light" "TV" Radio" if the module recognizes "light", load the words "on" "off" "color" "dim" and build a menu system. You can get the same (or even better) effect with Amazon Alexa or a Google app on your android. Using this module the voice recognition finds happens inside the module. You do not need internet access and perhaps even more important the privacy: The audio is not transmitted to the internet. A small disadvantage is that you need to train the module. My first test of the module was with an Ardhuino Uno. The ElecHouse website has a link Arduino library with some examples including a voice training example. Connect GND and VCC (5v) , RXD to Arduino pin 3 and TXD to Arduino pin 2. (If you do not like to use pin 2 and 3 you can use other pins. However you need to make a small change in the software). You only need to connect this four pins on the V3 module (and the included microphone) to a working Arduino to start. 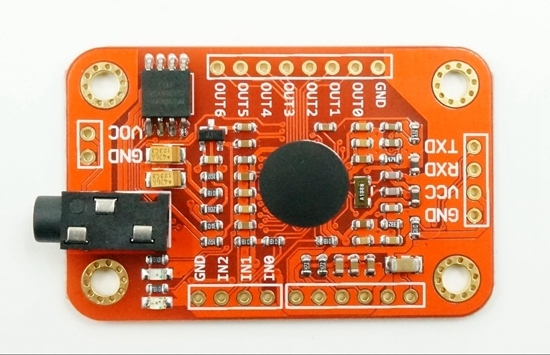 ELECHOUSE Voice Recognition Module is a compact and easy-control speaking recognition board. This product is a speaker-dependent voice recognition module. It supports up to 80 voice commands in all. Max 7 voice commands could work at the same time. Any sound could be trained as command. Users need to train the module first before let it recognizing any voice command. This board has 2 controlling ways: Serial Port (full function), General Input Pins (part of function). General Output Pins on the board could generate several kinds of waves while corresponding voice command was recognized. We already have Voice Recognition module V2. It supports 15 commands in all and only 5 commands at the same time. On V2, voice commands are separated into 3 groups while you training it. And only one group (5 commands) could to be imported into Recognizer. It means only 5 voice commands are effective at the same time. On V3, voice commands are stored in one large group like a library. Any 7 voice commands in the library could be imported into recognizer. It means 7 commands are effective at the same time.